Eucryphia glutinosa is a member of the family Eucryphiaceae and can be found at the base of the American Bank. This is the hardiest of all the eucryphias from Chile and is incredibly showy. For a tree, the flowers are huge: up to 6cm across! They are white with a large number of red stamens in the middle and are a sight to behold from July until September. 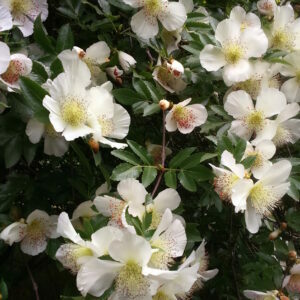 This eucryphia is usually evergreen in its native Chile, and can sometimes retain its leaves in this country. If, however, it loses them, they turn orange and red in the autumn. It requires a sheltered position in moist soil, and it is recommended that its roots are shaded from hot sun. It can grow up to 10 metres in height with a spread of 6 metres – it also carries a light fragrance!